The product features of the ASA eSpeed B25.14 tuning tool: The ASA eSpeed takes away the 25 km/h restriction. The ASA eSpeed takes away the 25 km/h speed limitation of electric bicycles with Bosch Gen2 and Gen3 motor in the all modes. The functionality of your HMI will not be affected: Speed, km, max-speed and average speed will still be shown correctly. High-tech product with microprocessor-based microelectronics. Installation without damage to the cables / you can undo the tuning whenever you want and restore your bikes original condition. Self-calibration for different wheel sizes. The light functiion will not be affected, too. 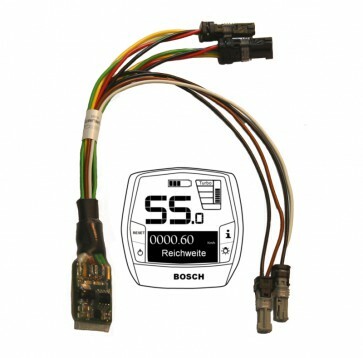 The electronic system of the tool can be controlled via the HMI. There are no additional switches, cables or dongles necessary or visible. Use status LEDs for functional control during the installation process. The device has user-programmable functions, too. ASA eSpeed B25.14 works with electric bikes powered by Bosch Bosch Gen2 and Gen3 with motor-support until 25 km/h (from 2014 onwards). Not suitable for Bosch Gen1 engines and older models. Note: You need special tools to install this device: The ISIS pull-off tool and the Bosch Spider (both tools are not included). We want to point out that the use of tuning devices like the ASA eSpeed is not allowed on public roads, because these tools manipulate the speed of your bike. You may only use electric bike tuning tools on private, closed areas or on designated routes. No liability is assumed for any current or future damages to persons and / or objects caused by the improper use / installation / deinstallation of the ASA eSpeed tuning tool. You have to use the ASA eSpeed for Bosch E Bikes at your own risk.